Spinning Wheel + Spring inspiration! 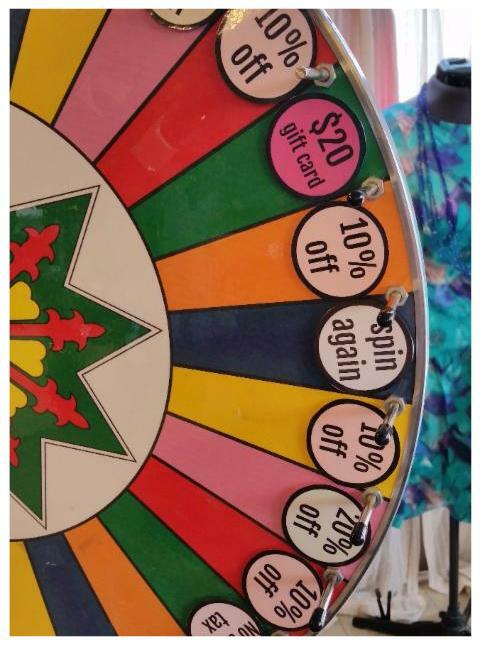 Spinning Wheel of Deals all Month! Spin for a discount with every purchase in April! The customer-favorite Spinning Wheel is back in April! Spin the wheel for for a discount with every purchase! Spins include 10% - 25% off your entire purchase, no sales tax, $5 off purchase and 30% off one item. Discounts apply to all items except those already discounted by 75%. Receive an extra spin to choose the best deal with our April Newsletter coupon (see below). We're filling back up since the last sale with hundreds of new items each week (see our consignment message below)! So much fun with spring colors & lighter-weight pieces plus beautiful jewelry. In addition to Spring colors, it's fun to add a few accessories to pull together your spring look. Add a floral or "garden creatures" accessory! 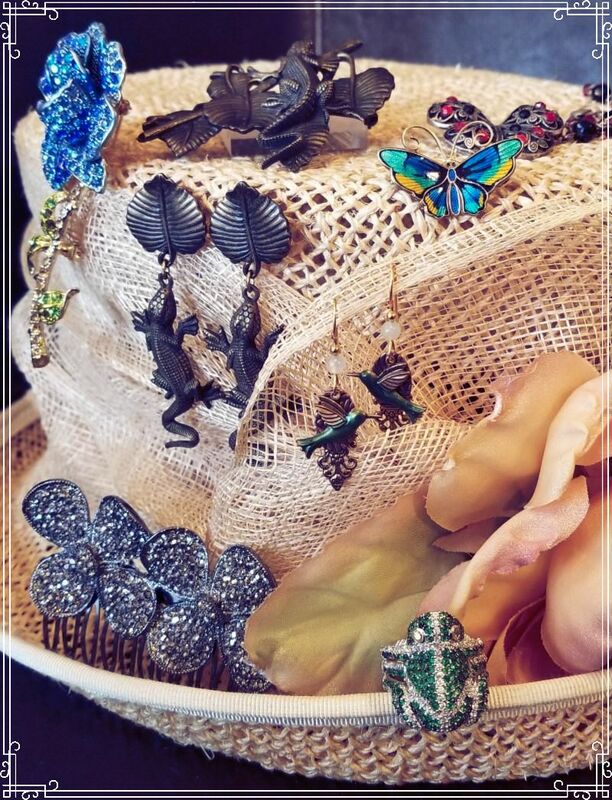 Pictured here we have raffia & floral hat, pins, hair comb, ring, necklaces and earrings with fun creatures and beautiful colors. Fun prints & colors are featured in our Lularoe items , including Disney-themed pieces in case you have an vacation planned to the parks this year. There are just a few Lindy West items left. We're featuring most of what's left on our Instagram page this week or come on in and see them in-store! 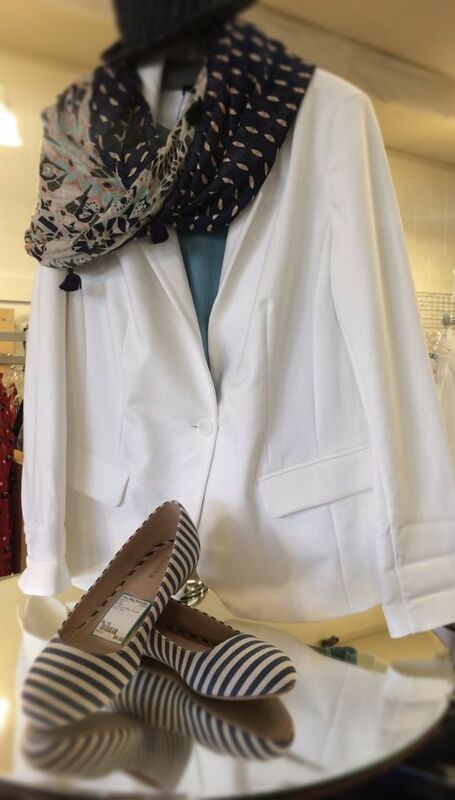 We're now taking Spring pieces including mid & lightweight jackets & sweaters, linen, pastels, jeans & khakis, capris, sandals and year-round shoes. Shorts & summer dresses will be accepted in May. Lightweight leather jackets and some ankle boots are OK, but we will be very selective. Between spring cleaning and Marie Kondo, we've have had a rush on consignment and are currently backed up on entering all our new treasures. We will continue to accept up to 30 items as a walk-in Tuesday - Saturday (Sunday by appointment only), but are scheduling appointments for more than 30 items a few weeks out and are not accepting any large drop-offs until we're caught up. In addition we have a LOT of jewelry, so please hold off on bringing in jewelry for a couple weeks. We're still pretty low on size 10 shoes and designer purses. A special call is going out for blue party dresses with the upcoming Blue Dress Party on June 1st. We've already had some shoppers looking for blue dresses and we definitely need more! As usual, check out our Consignment Guidelines for more information about our consignment process. Or contact us to ask specific questions. We will be CLOSED on Sunday, April 21st for the Easter Holiday and closed as usual on Monday, April 22nd. For Memorial Day weekend we'll be open on Saturday May 25th but CLOSED Sunday, May 26th and Monday May 27th. Use this coupon to receive an EXTRA SPIN on the Spinning Wheel and you can choose which spin you want to use! Discounts are valid on all purchases, including new layaways, except for items already discounted 75% off. Valid April 1-30, 2019 in-store only . Paper or digital coupon required. Also valid with new sign-up for newsletter mailing list.